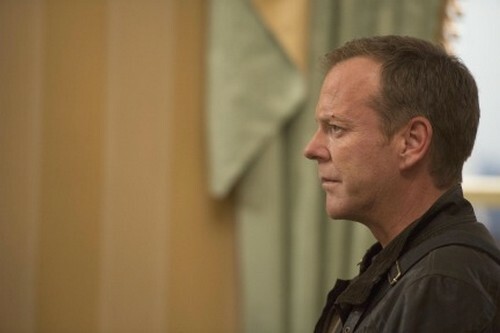 24: Live Another Day airs tonight with a new episode called, “Day 9: 8:00 PM-9:00 PM.” On tonight’s episode Jack remains laser-focused on pursuing his remaining leads; emotions escalate when Kate learns the truth about her husband; and Audrey confronts Mark about the duplicitous things that he has said and done. At the same time, the terror threat widens and the potential devastation becomes all too clear. On last week’s episode, Jack and Chloe had a plan in place to eliminate the terrorist threat before any more attacks rock London. With no time to spare and lives on the line, Jack and Kate pursued crucial leads in an attempt to gain the upper hand on the incredibly intense circumstances. Meanwhile, key players revealed their true colors. Did you watch the last episode? We recapped it all right here for you. It’s 8 pm in London. Kate gets a call from Jack for help. He tells her Navarro had Jordan killed. He says he couldn’t confront him and that Navarro stole the device. He tells her that the device can be used on multiple military systems and even ones from other counties. He’s in pursuit and tells Kate to track him and send a tac team unit. Navarro calls Adrian and confirms that he has the unit. He tells him to meet him at Liverpool Station and Adrian says arrangements have been made to get him out of the country. Navarro asks for assurances and Adrian says it’s his choice but he’ll get the death penalty if the Americans get him. Chloe asks Adrian what’s going on and he says it’s his device and he’s taking it back. He says Yates stole it from him to use for terrorism. Adrian says it will save millions of lives. He says they are going to exploit the vulnerabilities in firewalls by sharing them so that no one’s weapons will be any good if everyone’s weapons are wide open. Chloe says the device is at CIA and Adrian says Navarro took it and is on the way with it. He says he had to give files to the Chinese to pay for the operation but it’s worth the cost. He says it’s a world she would have wanted for Prescott and tells her to have faith. He says they’re so close. He takes her in his arms but she looks concerned. He asks is she’s with him and she says yes. Gavin calls Jack and says Navarro shut down the access to the CCTV cameras all around and he’s trying to get them back up. Jack finds Navarro who turns and fires on him. They exchange fire and it’s a foot race. Jack is closing in but then loses him. Navarro gets away and Jack studies the street signs trying to figure out where he went. Navarro is sent to a cement mixer to retrieve an envelope. He’s told to drop the device and go. He asks where his car is but there’s no answer. Chloe and Adrian pick up the device and walk away. Navarro goes running in a panic and the tac team surrounds Navarro. He knocks Navarro down and asks where the device is. They cuff him. Jack goes off running looking for it. He sees someone with the bag over their shoulder and goes off at a run. Chloe and Adrian are headed to the tube. Jack is closing in on them. He runs down the escalator shoving people left and right. Chloe and Adrian take their seats, the door closes and Jack runs to the train car. He sees Adrian and Chloe and calls out to Chloe but she doesn’t see or hear him. She’s not happy, though. Jack calls in and tells the CIA to track the train that just left Liverpool Station. It’s 8:10 pm. At 8:15 pm, Jack is told that the train’s emergency brake was triggered and they got off. Kate calls and Jack says Navarro gave the device to Adrian Cross and says that Chloe was with him. Kate says that doesn’t make sense and they wonder if Chloe was playing them. Jack says he can’t be sure and says he’s bringing Navarro back to CIA. Kate tells Ritter he’s the ranking officer now. He calls for attention and tells the CIA staff that Navarro has been arrested for the theft of the device and Jordan’s murder. He tells them getting the device back is priority one. Kate asks Gavin to check Jordan’s system to see if there’s something he was working on that triggered Navarro to kill him. President Heller has a drink when Audrey comes in and says he can’t miss alcohol with his medication. She says Air Force One is on the tarmac fueled and ready. He says he came over there to keep their drone bases and he’s going back with nothing but lives on his conscience. Audrey says he shouldn’t blame himself. He tells Audrey to tell the Secret Service that he’s ready to go and to notify the VP that he’s ready to make the announcement and he should be ready to take over. Mark comes in and says Ritter from the CIA needs to talk to him now. Ritter tells him the device was stolen and that Adrian Cross has it and that station chief Navarro stole it. Ritter says the device is far more dangerous than they knew. The device can penetrate the firewall of most country’s defense systems. Heller tells them to fully support Jack and keep him posted. Heller tells Mark to stand down Air Force One and get him a full report from DOD on possible counter-measures. Gavin tells Kate that Jordan was restoring files that Navarro deleted that had classified materials that Kate’s husband supposedly leaked. Kate asks if Navarro framed her husband and he says yes. Kate is stunned. Navarro is brought in and Kate heads for him in attack mode but Ritter tells her to stand down and go to her office. Jack asks what that was about and Ritter fills him in. He says they’re sending Navarro down to enhanced interrogation but Jack says he was trained to resist those. Jack says he won’t be afraid of them but says to give Navarro to him because he knows his history. Ritter says if he crosses the line, he’s pulling him. Jack says he’s not asking. He goes to Kate. She’s in tears. Jack walks closer and says her husband’s name is cleared. She says that’s too late because her husband hung himself a month into his life sentence all because Navarro framed him – and she thought he was her friend. Jack tells her he’s going to interrogate Navarro and tells her to decide if she wants to step aside. They’ve got Navarro hooked up to the machines and Jack says he doesn’t need biometrics. Ritter tells him to remember the ground rules and Jack scoffs and goes in. Kate wants to observe and is told she can. Ritter is also watching. Jack comes in and tells the guard to take off Navarro’s restraints and give them the room. Jack tells him he knows the drill but he’s going to lay it out. He’s selling secrets to the Chinese, stole the device, killed an agent and framed another. He says there is only one outcome – the death penalty unless he cooperates then he can have life. Navarro says he never knew he was dealing with Adrian Cross but can help them find the device in exchange for complete immunity, no negotiations. Navarro says it’s a weapon of mass destruction. Jack asks again where it is and Navarro says he knows Ritter won’t let him hurt him. Navarro says he’s wasting time and says to get him immunity. Jack says that option isn’t on the table. He says, your hand is and then crushes it to pieces with a gun. They haul Jack out. Ritter says they have to make the case for immunity to get the device back. At 8:26, they haul Navarro out to medical for treatment. Kate curses at her ex-boss then she and Jack stand glaring at where he went. At 8:31 pm, Mark tells Ron to draw up an immunity agreement for Navarro. He says the AG needs to sign off on it and Ron doesn’t like it but Mark says to take care of it. Audrey stands glaring at Mark and he’s distracted for a moment. Ron heads off to take care of it and Mark goes to talk to Audrey. She says she’s sorry for snapping at him earlier. Mark says it’s okay and she says she knows her dad put him in an impossible situation but Mark says it’s not about that. He says the moment Jack showed up, something changed for her. She says she and Jack were a long time ago and Mark says there are obviously unresolved feelings. She says she’s committed to him and he says he’s just an obligation. She gets mad and marches out. Mark then calls the Russian and says they can’t have Jack. He says the State Department will know that he forged the signature on the rendition order and says he’ll be going to jail. Mark says that they can find Jack. He says he has Jack’s encrypted comm link code and says they can pick him up in the field. The Russian says no one will know of his involvement if they can get him. Chell calls Adrian and says they’ll be operational in 20 minutes. She asks if he’s told Chloe everything and he says he has. They go to the car and Chloe puts her stuff in the car but then tells him she’s got to go pee. He tells her he’ll wait and she walks off to a porta potty then waves down a truck. Adrian shoots out the truck window and snatches the device from her hands. She asks why he would think this could work. She says giving weapons to everyone is no answer. He tells her to get in the car. She asks if he’s asking or telling and he says she knows the answer. He frog marches her off to the car. Navarro asks for pain medicine and the doctor says no. Late comes into the clinic with a gun out. She tells the security guy and doctor to get on their knees. Navarro says she shouldn’t do this and she bashed him with the gun. He says if she kills him the CIA will never get the device back. Jack comes in and Navarro calls out to her. Jack holds a gun on Kate and Navarro says the device has a tracker code. He yells it out as Kate holds the gun to his head and threatens him. As soon as he yells out the code, Kate asks Jack if he got it and Gavin confirms he did. Kate and Jack’s bad cop, worse cop scam worked. They walk out and leave him in the med bay. Gavin starts the trace and says it looks legit. Jack says it worked and walks out. At 8:37 pm, Kate tells Navarro she’s going to watch when he’s executed for treason. At 8:42 pm, Jack tells Ritter that Kate broke Navarro and they have a lock on the device. Coburn and the military reps give Heller an update on the device’s capabilities. Mark comes in with the immunity agreement and Heller says they don’t need it. He says that Jack and the CIA are headed to the device and Mark is horrified to know that Jack is involved. That means the Russians are headed to the device too. Kate and Jack are together with several tac teams for backup. He asks if she’s okay. Kate says the last time she saw her husband they were working on his appeal and she says he was heartbroken when he realized she didn’t believe he was innocent and she says that was the moment he decided to take his life, because she had deserted him. She asks how she can live with that. Jack says, you just do. He tells her that four years ago, his friend was killed and he took as much revenge as he could and it cost him his family and everything else but it didn’t ease the pain. He says in her heart she has to accept it and begin to forgive herself. Adrian and Chloe head into Open Cell’s new ops center. He says it used to be a college tech lab that closed. She asks if everyone knows what he’s going to do with the device and he says yes. When they come in, they find all of Open Cell has been shot and killed. She runs to Stosh who is still dying. Adrian tells her they have to go now. Then the Chinese show up – a guy named Cheng – and Adrian tells him to take the device. Adrian asks why he did it. Cheng says that Adrian caused this by trying to give away the device to the world. Chloe tells Adrian that Cheng doesn’t work for the Chinese government anymore. Adrian is shocked that Chloe knows him. Cheng tells Chloe it’s been a while since he’s seen her. For those that don’t remember, a couple of seasons ago, Jack broke into the Chinese embassy and accidentally killed someone. The Chinese government sent Cheng after him. He had Jack kidnapped and then Audrey went to China to save Jack. Instead, she was kidnapped by Cheng who then faked her death. Meanwhile Jack was released to the US who then handed him over to a terrorist group that wanted him. When Jack got away from them and stopped the attack, then he found out Audrey was alive and rescued her from the Chinese. Then her dad told Jack to stay away from his daughter because he’s cursed and everyone he loves dies. Jack agreed and left her alone although she was a mental basket case from her imprisonment in China. That’s the backstory on Cheng – he knows Chloe as Jack’s sidekick and partner in crime. Cheng’s men set up the device as Adrian asks Chloe who Cheng really is. She says he was Chinese Intelligence who ran the consulate in LA. His country had him arrested, he’s wanted by his country and he kidnapped and tortured Jack and Audrey. Chloe says he’s crazy for working with him. Cheng wants to know how the device was changed and he explains that it was modified to focus on US drones. Cheng tells Chloe that she can fix it and she refuses. He shoots Adrian in the leg and says the next one will go into brain. At 8:48 pm, she agrees and is lead over to the computer station to get to work. At 8:53 pm, Mark leaves the Russian a message telling him not to apprehend Jack and to call him. Jack calls Gavin who says he has a lock on it. Ritter tells Jack not to hesitate to call in back up out of concern for Chloe but Jack snaps back that the device is his priority and to focus on his job. Chloe works on the device and Cheng pressures her on time. She wants to know why he wants it and he won’t say but presses her. He tells her to get up and she’s dragged away. The tech says he can take it from there. Cheng knows she planted a virus while she was in there – they were watching her screen on a screen that mirrored hers. Adrian tells Chloe they won’t get out of this alive. He says he needs to tell her about her husband and son. He says he found some documents a year ago that showed their deaths were simply an accident and that no one was trying to kill her and got her family instead. She asks why he would keep it from her and he says he didn’t want her to leave. He says he would have told her eventually because the truth is always best. She tells him all his work and truth has lead to this. He says he doesn’t regret what he’s stood for. Cheng is in the Naval Command interface and tells his tech to draft the order. He says he has no more use for Adrian and shoots him in the head. Jack tells Ritter to hold the tac teams back so they’re not seen on satellite and Ritter agrees to hold them two miles back. But then a car crashes into Kate’s side of the car crushing the car. Ritter hears it and calls out to them asking what happened. They don’t respond. Jack and Kate are alive and they hear the Russians. One says, make sure they’re dead. Kate and Jack come out shooting and there’s a firefight between them and the Russian. Chloe watches as the Chinese tech types out a command to the USS Massachusetts, a nuclear sub, from US Strategic Command. Chloe asks what the order is, but Cheng tells him to send it. On the Massachusetts, they get the order and open the safe and the encryption key. The order says to fire and sink the Chinese carrier Shenyang. The order was confirmed from STRATCOM so he preps the torpedo tubes and they take aim at the Chinese military vessel. They fire two torpedoes. Jack and Kate are still fighting for their lives. At 9 pm, the torpedoes hit the ship and it’s blown to pieces. Chloe is horrified as she and Cheng watch on the screen. She says, Oh my God.